I have been living in France for one month and have not come into contact with escargot. As a kid, I believed that this was all the French ate, perplexed by their ways. As I grew older, I began to understand that this dish was not something the French ate every day, or even at all. In my class last week, my professor asked if the French students ate the dish and they responded with a resounding "no" amid one "on occasion". The cuisine of the French is complex, but I learn more each day. My first trip to the grocery store resulted in 3 boxes of Barilla pasta, a brand I know well from home. The ordinary act of food shopping made me overwhelmed due to the plethora of unfamiliar brands and absence of favorites. At checkout, I bought a reusable bag to avoid the charge and fumbled to quickly place my groceries in it before the cashier asked for my cash. As I became more comfortable, I found both familiar foods and new items to try. I embraced the French taste for yogurt, shown by their endless aisles of the product. I would eat a crêpe every day if I could. I no longer feel lost amid the aisles and feel excited by the untried. While I have found many new preferences, I miss some of the foods I am accustomed to eating. For instance, popcorn, guacamole, peanut butter, bagels, and iced coffee (or large coffees of any kind) are hard to find or too expensive. However, this inavailability has translated into an exploration of a new culture through food. I still have a lot to learn about French cuisine. 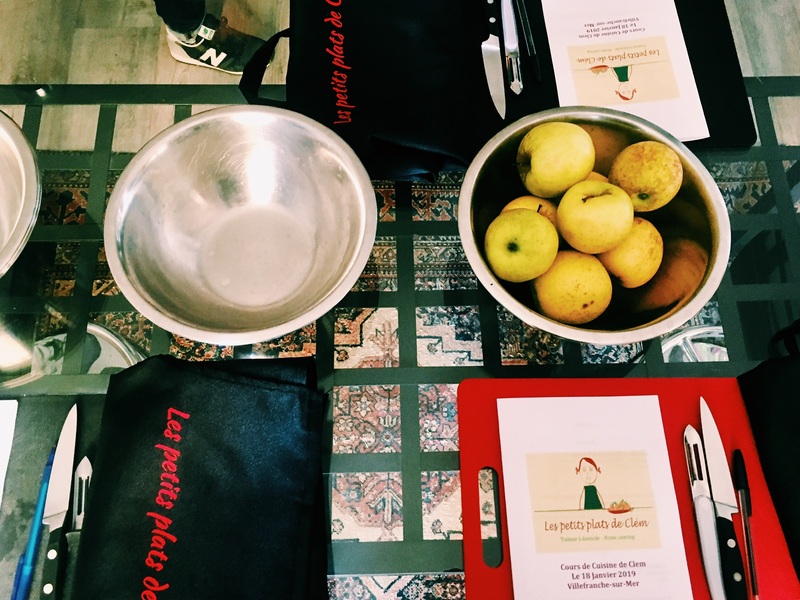 I recently attended an IES Abroad French cooking class in Villefranche-sur-Mer with Clém, a wonderful cook who owns her own catering company. Invited into her aesthetically pleasing home with trinkets and plants decorating the space, French music playing, and a large cat named Socks blissfully sleeping on the couch, I felt welcome. From the start, cooking was a hands-on experience, characterized by delicious tastings and technical blunders. The three of us apprentrice chefs donned our customized aprons and prepared the dishes with the guidance of Clem's instructions. The home-cooked meal, complete with an entrée, plat principal, and dessert, gave me a peek into French cuisine and culture. I am thankful for the experience and hope to replicate the delectable dishes in the future. In addition, I cannot wait for the Nice food tour later in the year!